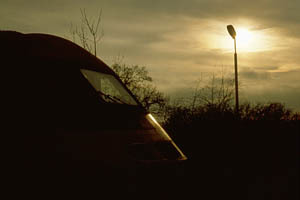 Intercity, in conjunction with Hertfordshire Railtours, are currently (Nov. 1988) advertising a range of "125 Specials" - "Railtour excursions by Intercity 125 High Speed Trains, from London and the Midlands". One such was the "Settle and Carlisle Circular", offering an interesting route in addition to an eleventh hour trip over the S&C. I booked tickets for myself and an accomplice for the trip from New Street on November 19th, and quietly forgot about the it until the tickets arrived, a week beforehand. Various diversions due to engineering operations meant an earlier departure from New Street - 7.14am to be painfully precise! Another 5.00am crawl from the pit! The train actually arrived at New Street nearly 20 minutes late - a points failure meant it had been diverted via Perry Barr and Soho, only to be balked by a slow moving freight. A bad omen? Our first diversion was to head for Nuneaton via Coventry, rather than the direct line, then take the recently reopened route via Bedworth. I wondered, as we passed along the track, how often a 125 unit had passed this way before, a thought which was to be repeated before the day was out. Reversing again at Nuneaton (or ne pas mangé‚ as the PA announcement called it on the way back) we took the Leicester line, picking up en route at the new station of South Wigston. An interesting array of motive power was resident at Leicester depot - 47s, 56s, 08s, 46 023 (!!) and a rather derelict EMU, presumably on its way to Vic Berry's. The 46 - departmental 97402 - is one of three allocated to Derby Technical Centre, according to the Industrial Railway Society's Handbook 7EL. The train made its penultimate pick- up at Loughborough, before heading for the last pick-up and last reversal before Carlisle, at Nottingham. And we left on time, having made up fully 20 minutes! Here beginneth the tour proper! We retraced our steps to Trent junction, before heading north through Toton yard, passing dumped 25 209 and lots of 20s, 56s 58s etc. A little further north we passed the sadly bereft track bed of the NCB line to Moor Green, where a few years ago I spent a pleasant hour or two photographing "Robin" and "David", bright red and green respectively, ex-BR 08 shunters. Presumably now resident in the great exchange sidings in the sky! At Dore South Junction, we took the west-bound line, the threatened freight only link to the Hope Valley route. The weather was looking rather unfriendly as we headed for Cowburn tunnel, and ran down, via Chinley and New Mills to Manchester Piccadilly. I had hoped for the Stockport route! After pausing at the through platforms for a crew change, we were away again - 14 minutes down now, though not for long. A (literally) new morsel of track lay ahead - the Windsor Link to the Bolton line. We arrived at the latter just 3 minutes late, then on via the Blackburn line, arriving on time. Now for a much longer unexplored stretch - the line to Hellifield, which sees no regular traffic along its length, just specials and diversions. Certainly the sheep grazing on the lineside looked surprised! Whatever the destiny of the S&C, this line seems most unlikely to survive the next 12 months. As a child, I spent some time with a cousin in Hellifield. Uncle Bert was the village Baker, and from his lounge window, above the shop, we had an excellent view of traffic joining the main line from our present route, the northern-most tip of the L&YR. In the early sixties there seemed to be an endless procession of freights onto /off the "Lanky" - where have they all gone? A lengthy pause at Hellifield gave us ample opportunity to survey the sad decay of the station, but also meant we were 20 minutes late at Settle Junction, where we joined our main objective. The Settle and Carlisle was its usual self - glorious scenery and an ever-increasing number of speed restrictions. There is currently a 20mph slack for about four miles north of the summit, across Mallerstang Common. Nevertheless our tardiness was down to 10 minutes at Appleby, where it was announced that our 45 minute stop would not be curtailed, much to the relief of our legs which were by now greatly in need of stretching. Victuals were running low too - time for replenishment. An uneventful run from Appleby took us to the Border city, whose geographical location was evidenced by a class 26 in Railfreight livery, slumbering in the sidings. We stood for barely 14 minutes, before sliding away again into the gathering dusk, for a lengthy run along the metals of the former North Eastern Railway - we would, if all went to plan (! ), be travelling from its western extremity to its southern, at Shaftholme Junction, just north of Doncaster. The run along the Tyne Gap route is a pleasant one, though before long the growing darkness meant we could see little but the lights of the towns and villages along the way. From Blaydon trains for Newcastle now head along the south bank of the Tyne, a route which originally closed to passengers in 1926, re-opening in 1984 when the north bank route was closed. A noteworthy feature of this route is the vast "Metro Centre" shopping complex, which looked horrendously busy! We were not headed for the capital of Tyneside however, but southwards via Low Fell junction towards Durham, whose illuminated castle and cathedral formed the next identifiable landmark. The main line through Darlington was closed tonight however, and we were scheduled to take the Ferryhill - Stockton - Northallerton diversionary route. The first part of this route is normally freight only, as witnessed by the short (40 foot?) rails along part of the stretch. An easy schedule for this part of the journey necessitated a lengthy pause at Eaglescliffe, before taking the line to Northallerton, which carries substantial freight traffic but just one scheduled passenger working each day, the Cleveland Executive. Instead of entering Northallerton station by the direct link to the fast lines, we continued under the main line from Low Junction, through Boroughbridge Road level crossing, regaining the main line via the up Longlands loop. Passing through the level crossing the reason for the detour became obvious - bridge reconstruction work in the station itself, with class 37 and Krupp crane in attendance. Somehow we managed to lose time to York. "Never mind" I said, "we'll fly to Doncaster". We didn't seem to be proceeding with undue velocity however, and when we passed through Church Fenton, our suspicions were raised. "Perhaps we're going to take the Leeds - Selby line at Gascoigne Wood" I suggested, only to see the overbridge pass by a minute or two later. At this point the tour organiser commented over the PA system that we were not on the scheduled route, but would regain it at Gascoigne Wood! Perhaps we would take the Knottingley - Shaftholme Junction route from Ferrybridge? Eventually the truth was revealed. The driver who joined the train at York didn't know the Doncaster route, so we were taking the old route via Pontefract Baghill and Moorthorpe. So much for flying, I reflected as we crawled across the pitfall slacks! We left Sheffield 15 minutes late, to retrace our earlier steps from Dore South Junction back to Brum. The 15 minutes became 17 on leaving Nottingham, then gradually pulled back to just five minutes on arrival at New Street at 2203. We had hoped for a slightly earlier arrival, to catch the 21.59 back to Wolverhampton. No cause for concern - it was just arriving in Coventry as we left! "I bet that's it, running late" I commented. "'Course it isn't" said my friend. It was, fortunately, so we were able to avoid a much longer wait by joining it for the last lap. 14 hours is a long time to sit on a train; at least the seats and ride were comfortable, unlike some of our DMU jaunts! A pity more of the journey could not have been in daylight; nonetheless a most enjoyable day out, and well worth the £19.75 fare.